Students then put everything together to form a powerful communications plan involving both the Internet and traditional message distribution. 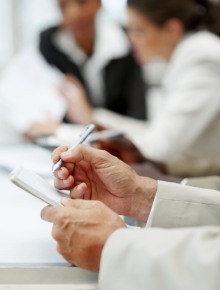 You will also gain a core understanding of basic crisis communication planning. See the FAQs About Sponsored Courses for more information, including Wait Lists. This course and any combination of its topics are available as custom on-site training for your organization. We can tailor this course for your agency, association, business, or NGO. For more information about how this training can help your members and staff, please contact our client liaison. Touch on common reporter "problems"
Who are the people in your organization that can help you or not. What should go into a media kit? 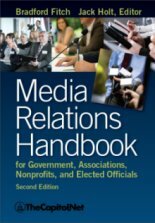 Course Materials Course materials include the Training Edition of "Media Relations Handbook for Agencies, Associations, Nonprofits and Congress," by Bradford Fitch. Approved for .7 CEUs from George Mason University. 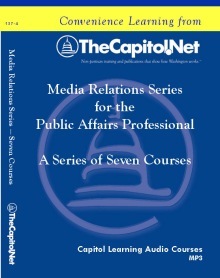 Our faculty members all have a minimum of 10 years' experience working with the national media.